The Blackstar HT-20R MkII is a 20-watt valve powered combo guitar amplifier with two distinct channels and four different voices to play wit.. The Blackstar HT-20R MkII is a 20-watt valve powered combo guitar amplifier with two distinct channels and four different voices to play with. Blackstar’s hugely popular HT-20R combo amp has returned and is even better than before. Two channels are on offer, each with two unique voices that give you the best of British and American amp sounds. Powerful EQ with Blackstar’s unique ISF control along with high quality digital reverb all help to get you the perfect tone you’re looking for. The Blackstar HT-20R has two distinct channels; a pristine Clean channel and an Overdrive channel. Each of those channels two footswitchable voices for you to choose from. With the Clean channel, you get the best of both sides of the Atlantic. When Voice 1 is selected, you get an American inspired tone that is clean, bright and refined with strong and consistent bass response. Switch over to Voice 2 for an extremely responsive chime with loose bottom end, giving you that classic British tone that you can drive hard to push into mid-range overdrive. For some extra sonic adjustments, the Clean channel has volume and tone controls. Move over to the Overdrive channel and you have gain and volume controls along with two more distinct voices. Voice 1 gives you classic British Blackstar overdrive that is rich and natural sounding. You can play it nice and clean or take it up to a real Super Crunch. Select Voice 2 for a “High Gain” sound. 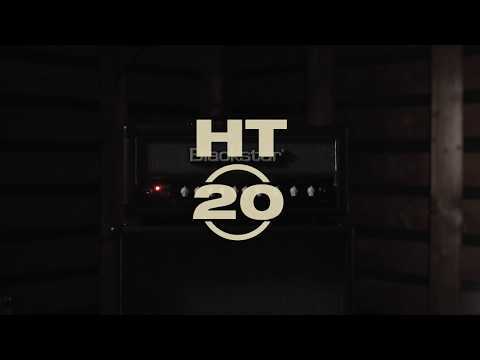 Derived from the critically acclaimed HT Venue MkII high gain sound, the HT-20R MkII’s overdrive gives you aggressive high end with tight and resonant low-end. There’s also a slew of other controls on board to help you shape your sound to perfection. An OD equalisation section gives you the standard bass, middle and treble EQ controls to sculpt your overall sound. Next to these, you’ll find the Blackstar HT-20R MkII also boasts an ISF control. The patented Infinite Shape Feature works as a contour or shaping control for your sound. Turn the ISF control anti-clockwise and you’ll get a scooped midrange, adding some American inspired sounds to the amp’s character. Turn the knob clockwise and you’ll get more pronounced midrange and top end that is reminiscent of classic British amps. Of course, you can go all out or find your perfect balance somewhere in between to really refine your sound. While the Blackstar HT-20R MkII can give you 20-watts of awesome EL84 valve power, there’s also the option to take it down to 2 watts. This setting is ideal for playing at home when you need to have the volume down while keeping the fantastic valve tone. If you need to go even quieter, you can just plug in your head phones. USB audio connection is on board so it's ready to just plug-in and get recording. You'll also find mp3/line input in the back so you can play your favourite songs through the amp. There are also a number of speaker output options including 1 x 16 OHM, 1 x 8 OHM and 2 X 16 OHM. Another great feature found on the Blackstar HT-20R MkII is its emulated output. This allows you to plug directly into an audio interface or PA system and capture your performance but with emulated cabinet sound. This means you get the true flavour of your amp without having to use a microphone! Ideal for recording. What’s more, it gives you the option of emulating either a 4x12 or 1x12 cab. A fantastic combo amp with awesome valve power and four distinct voices along with some powerful tone shaping controls. Buy the Blackstar HT-20R MkII valve amp from Professional Music Technology today and get this great sounding, extremely versatile combo amp for yourself.